Dinosaur Cookie Cutters by Fred. I will admit that I have a rather ... humongous ... cookie cutter collection. But that doesn't stop me from wanting to add to my collection. These days, though, I'm not looking for another star or flower. 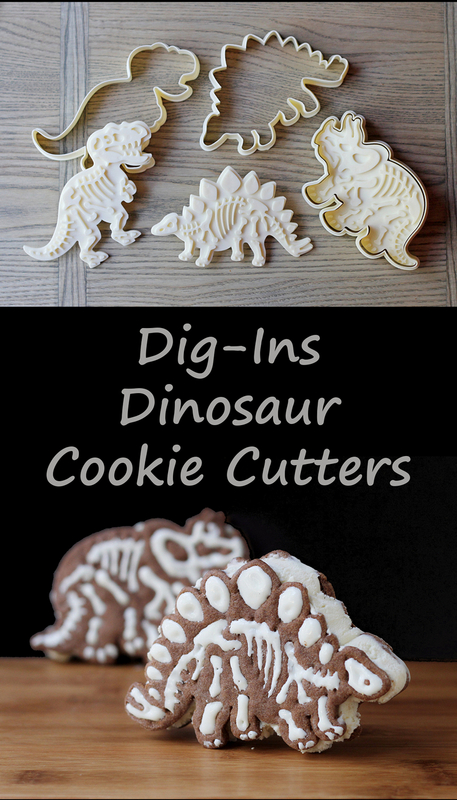 I was particularly smitten with the Dig Ins dinosaur-themed cookie cutters from a whimsical company called Fred. What I was most amused by was that they aren't just dinosaur outlines, but they impress the cookies with dinosaur bone designs. So the cookies are like you just dug up some dinosaurs. Neat, right? I have a few cutters that work like this. Some are a single piece, but these cutters are each two pieces, with the cutter separate from the part that makes the impressions, so it's a little more versatile. You could, for example, impress the bone pattern into dough that you're not cutting into cookies. At the moment, I'm not sure why I'd do that, but I'm sure there could be a reason. Or ... impress the bone design into bread before making toast or a grilled cheese sandwich? That might be interesting, yes? While it's not exactly cookie-baking weather here, I used the cutters for making cookies that I used for making ice cream sandwiches for a magazine article I was writing. I liked the way they came out, and I think kids would totally love them. The one problem I had - and it's a me-problem and not a cookie cutter problem - was that I decided to cheat and buy a premade cookie icing in a tube. When I cut the tip, I made the hole a little too large, so I had a little trouble piping the finer lines on the cookies. 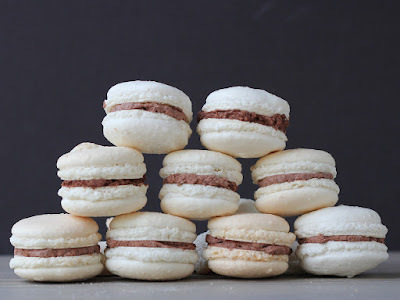 If I was making a lot of cookies using these cutters, rather than just a few as an example of one possible shape for the article, I would have used my own icing and I would have used my smallest piping tip, and everything would have been perfect. Who's it for: People who like quirky cookie cutters. Or people with kids who love dinosaurs. Pros: Easy to use, easy to clean. Cons: The cookies are a bit on the large side. That means the portions are larger, but on the other hand, smaller cookies wouldn't be able to have as much bone detail. Wishes: I totally love this set - I could see doing a second set with different dinosaurs. A few years ago, I was on a mission to find a pi cookie cutter. Not a cutter to cut pie cookies, or cookie pies. Or even pie-shaped cookies. I wanted a cookie cutter in the shape of the Greek letter pi. I wanted it for pi day (March 17) and I wanted it just because I'm goofy and geeky. I looked for hours online and couldn't find one for sale anywhere. Eventually, I found an obscure website where a guy would make cookie cutters from copper by hand. No doubt quenched in the tears of virgin unicorns. They were that expensive. I let the idea rest. It wasn't that important. So, to get started, you can send me an image of something that you'd like to make. I make cookie cutters and cookie stamps (the latter having detail on the inside in addition to the cutting edge). Cutters are $8 and stamps are $10. As far as the designing goes, the less detail the better. I ask customers to keep in mind that when baking, some of the detail will be lost. Turnaround time is generally 1-2 weeks. It is possible that I can get them done sooner but, since I'm also Assistant Manager, it's unlikely. The 1-2 weeks is also a cushion in case I experience some error with the printer (the hardware and software can both throw me curveballs every once in a while). I emailed him a pretty version of the letter Pi, and he asked me if I wanted red, green, or orange cookie cutter, and what size I wanted. In no time at all I had a brand new cookie cutter. Easy peasy. I haven't actually tested the cookie cutter yet, but ... seriously ... it's a cookie cutter. It's not like there are moving parts or anything. The cutting edge is plenty sharp to get through cookie dough, and the shape is exactly what I wanted. Who's it for: People who want a cookie cutter shape that might not be commercially available. Like for company or school logos. Cons: You need to have a drawing or a shape they can follow, so you can't just ask for a three-horned dinosaur with a spiked tail and long eyelashes. Not that anyone would ask for that, but you know what I mean - they won't design your logo for you. Wishes: I wouldn't mind if the cutting depth was just a little bit deeper. This is fine for cookies, but sometimes I use cookie cutters for other purposes. I might have said this before, but I used to be quite the snob about spice mixes. I thought, gee, if I own individual spices, why on earth do I need a blend? I can mix oregano, basil. marjoram and rosemary ... I can mix lemon and thyme. What I was saying was that I can mix the easy stuff. That's before I knew anything about Indian food, where the list of spices can be a mile long. Now I know better. When the folks at Indian as Apple Pie asked me if I wanted to try their products, I said sure. This showed up. This is the six-jar Custom Blend Spice Set with generously sized jars of spice blends. The first thing I did was sniff all of them, and I can tell you that they're fragrant and definitely different from each other. The second thing I did was use the Tandoori Masala as a dry rub on a pork roast. I wasn't trying to make a true Indian dish - I just wanted to sample it and and add some flavor to the roast. Wow. A little bit of rub truly did add a lovely punch of flavor. Since then, I've tried a few other flavors and I have to say that I'm really impressed. I still haven't made an actual traditional Indian dish with any of these, but that's fine. I'm okay with using the flavors of a cuisine in non-traditional ways. Sooner or later, I will make a traditional Indian dish, but meanwhile, I'm enjoying them on different meats and vegetables. 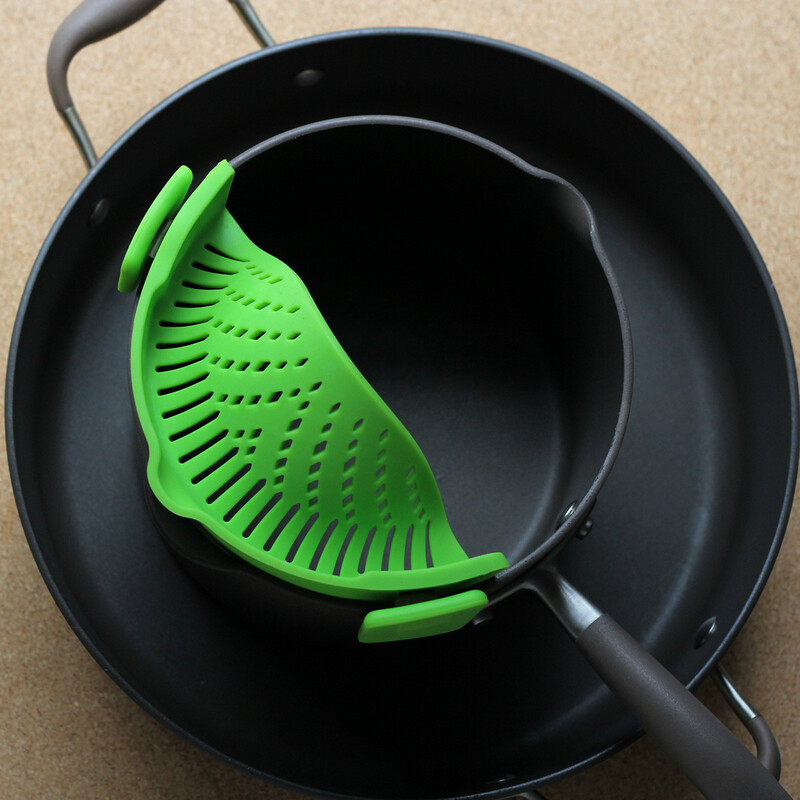 Who's it for: Anyone who wants an easier way to make Indian cuisine and use Indian flavors. Pros: The prices seem very reasonable for the spices. Flavors are very good. I've tried other Indian spice blends, and I have to say that something about these is much more appealing - brighter and deeper flavors. Cons: When you're buying spices online, you can't sniff them to see which you like best. Wishes: For people who don't know which blends they like the spice set is a good idea, but it's a lot of spice - it would be great if there was a sampler set with smaller jars or even packets for people who aren't sure what they will want. Green Olive and Pimento Bread. It's a wooden board from the J.K. Adams 1761 collection . I have a lot of different wooden boards, but what I really liked about this one was the color. I make a lot of ... well ... brown food, like bread and baked goods. I like using wooden boards and natural colors in photos, but I also like some contrast. I mean, peanut butter cookies on a medium-brown cutting board isn't all that exciting. It's got a leather loop for hanging. Most folks would probably use this as a board for cutting bread because it's long enough for large loaves, but I'm planning on using it mostly for photos. So, when you see it on my blog, you know what it is! Slate is a type of rock, and also a color. Like slate gray, right? This type of board is usually used for serving cheese and it's from their Charcoal Slate collection. It's a dark gray - not black - with lovely texture. You can see the edges of the board in this photo. What I love about this is that while it's dark, it's not totally black, and it's a natural material. The texture is also nice, compared to all the flat surfaces I usually use, like normal dishware and cutting boards. It's also very easy to clean. I previously reviewed their Trilogy Collection boards, here. If you like pretty serving items - or if you're a blogger or photographer, the J,K. Adams site has lots of fun stuff to browse through, and new items added pretty often. I found a few things just now that were new and interesting. Who's it for: Bloggers as well as normal folks who like pretty serving pieces and cutting boards and other gear. Pros: Good quality products; a lot of variety on their site, so there's something for everyone. Cons: Some of the items are on the higher end of the budget, but they'll last a long, long time. Wishes: So far, I've been very pleased with all of their items. Source: J.K.Adams supplied these to me for my use in photos - I wasn't required to write a review. But... so many people were asking, so I figured you wanted to know! I've been using these lids regularly for more than a month, so I wanted to update this post. First, the mini lids are now available for sale, and the square and rectangular are coming very soon. The reason I love reusable lids like these is that I used to go through plastic wrap at a ridiculous pace, and a lot of it was for covering bowls of rising dough or for covering other bowls that didn't have their own dedicated covers. 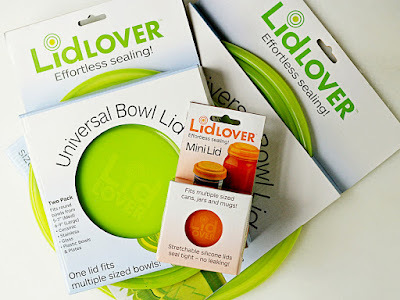 So when I got a chance to test LidLover lids , I was really curious. Would they work? Unlike other stretchy lids I've tried, these have concentric rings that make it easy to fit the lids onto different sizes of bowls or other containers. That doesn't mean there's one size that fits everything, though. 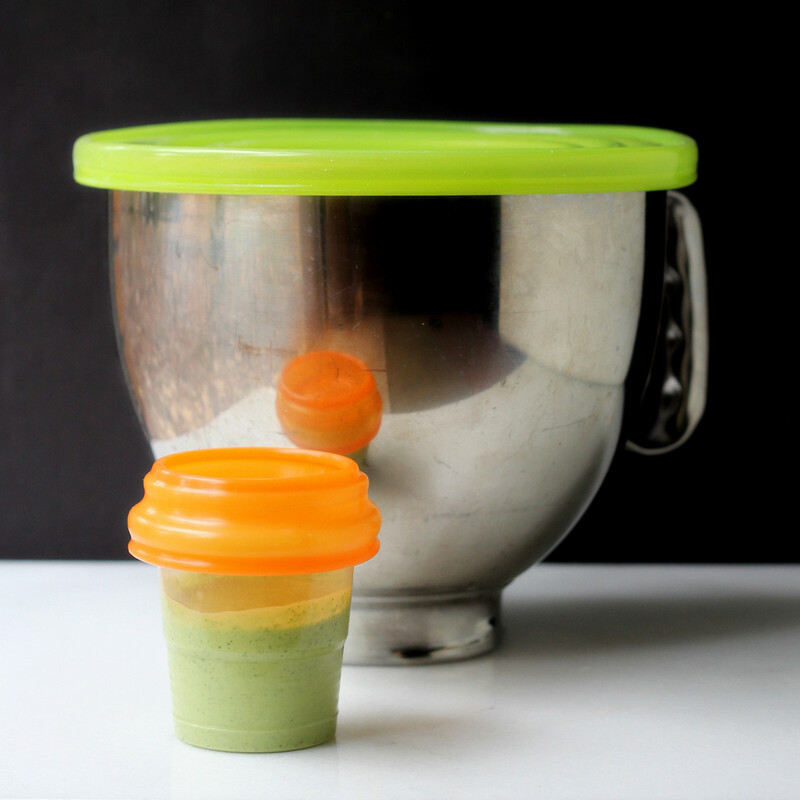 There are small lids that fit cups, glasses, jars and food cans, and three different larger lids for large containers. 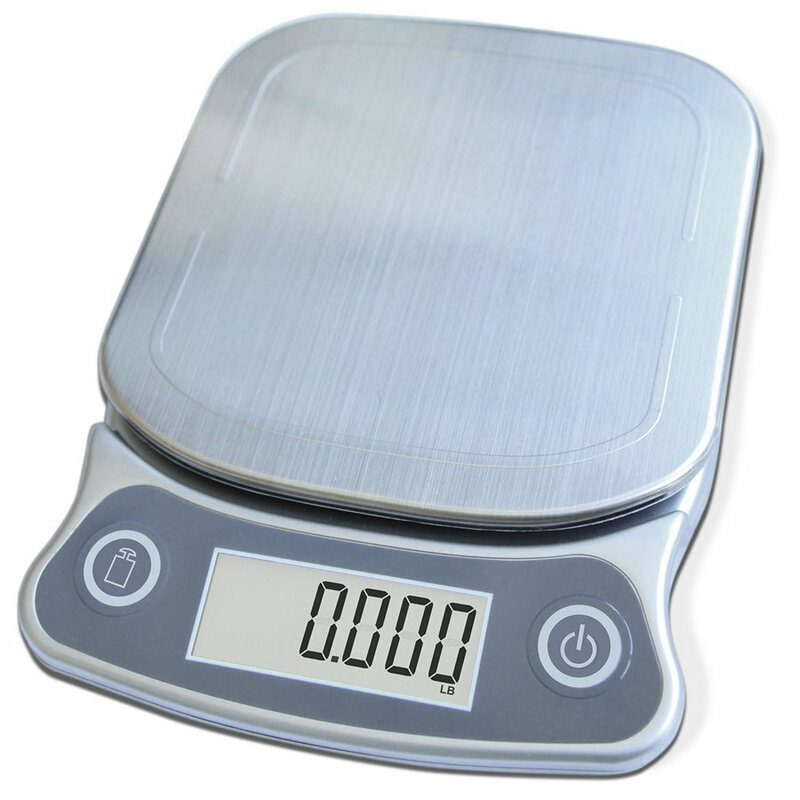 The largest size is sold solo; the middle-sized lids are sold as a pair of two different sizes; the smallest (now available) come as a pair of the same size. The lids can be used right-side up, or upside down. That doesn't seem like a big deal since the lids stretch, but I found that sometimes the fit was better if I flipped it over. The lids are made from silicone, which means they're safe in a wide range of temperatures - freezer to dishwasher to oven ... although I can't imagine why you'd use them in the oven. I've tested them on different containers made from different materials, and they work well. One of my biggest uses for covers is my stand mixer bowl, since I need to cover it if I have bread dough rising. Over the past few years, I've tried different covers, and many of them failed to hang on when the dough rose and gasses stretched the lid. This one, because of the rings, has plenty of ability to expand before it starts to stretch, and even with the little bit of stretch required, it hung on tight. I've had a small one on a plastic container in the refrigerator for quite a while, and it's still holding on. Most things that I plan on storing long-term go into containers with their own dedicated lids, but there are plenty of times when I'm marinating something, or I have a salad pre-made and in a serving bowl, and I want to cover it before it goes to the table, or I want to stop the splattering in the microwave. 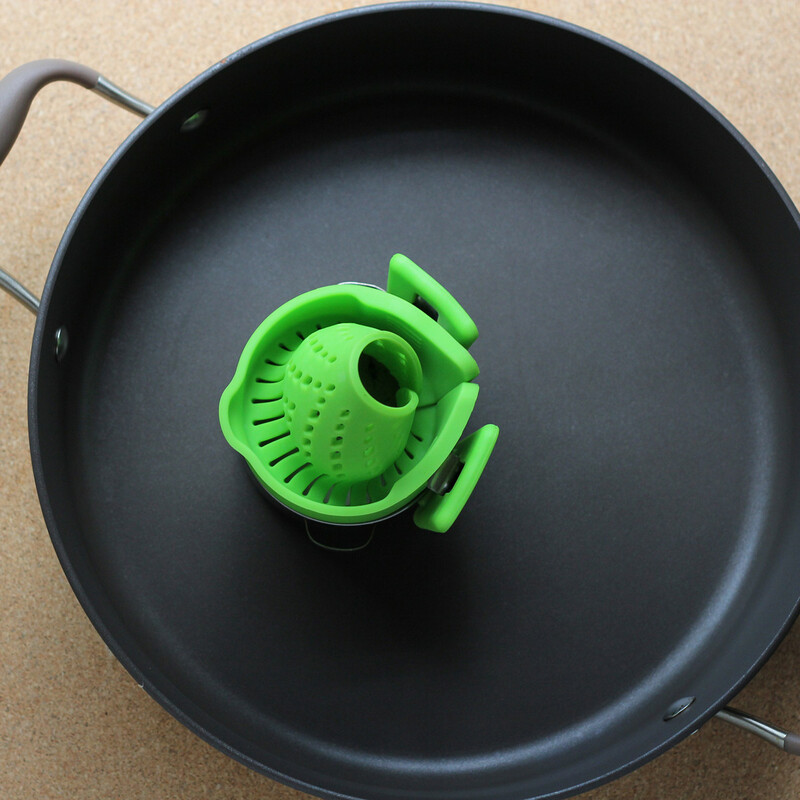 These lids are perfect for all of those uses. While they work well for longer-term storage, I usually think of covers like this as a short-term solution, mostly because the containers I use for long storage have their own lids. 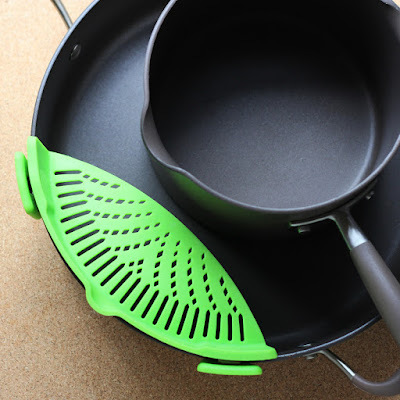 After using these for over a month, I have to say that they've held up well and that I actually use then quite often, both as a loose cover in the microwave, and as tighter bowl cover. I've washed them multiple times in the dishwasher, and there hasn't been any color fading or other signs of wear. While I'm sure they're not indestructible, they should last for a good long time for normal use. Okay, I knew you could use them either way. But they wrote little notes on top of the lids and said that the notes could be wiped off. So I grabbed a paper towel, moistened it, and the ballpoint-pen notes wiped right off. Isn't that cool? You can write on them and the text wipes off really easily, so you can label things in the refrigerator without permanently marking the lids and without using tape that you have to peel off - which of course could leave a sticky residue. I know that's not the most earthshaking thing, but I thought it was worth noting. Who's it for: People who have lidless bowls and containers. Pros: Each one fits multiple sizes. Stretches. Wide range of temperatures. Wishes: Colors are limited. Not a deal breaker, but I love when products have color choices.